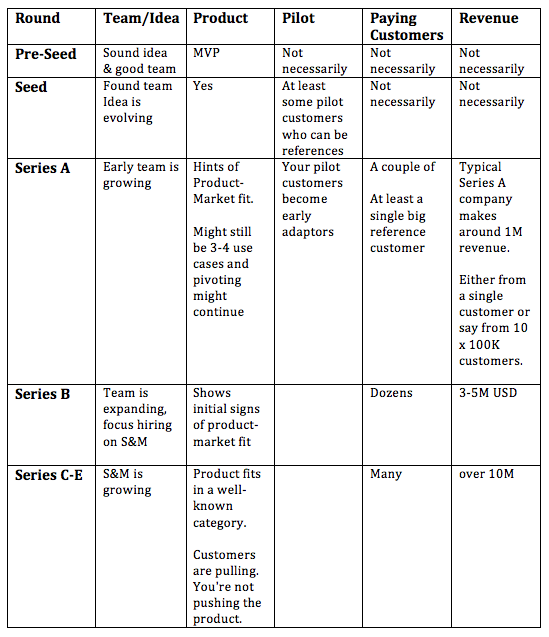 If you're like me and looking for an insider's insight on how startup funding rounds actually works out in the field in US and as of now, I have good news for you. Today I've come across this awesome video by Business Security Weekly, hosting William Lin of Trident Capital, a VC specializing on cyber security startups. I had the privilege of chatting with Will over several occasions, I can say that his promotion to a Principal at Trident Cyber was not that much of a surprise to me. Well deserved. Anyhow, I strongly advise you to go over the video. But for the impatient, below are some notes that I took from the conversation. What are the typical KPIs or specifics that are expected of the startups in each funding round? What are the average check sizes in each funding round? Pre-Seed - Around 1M USD. Can be below 1M or as much as 2M, though rare. Seed - Around 1-4M USD. Series A - Around 6-12M USD. Mostly on 8-10M USD range. Funding rounds typically provide 18 months to 3 years runway. Median runway is around 2 years. First year in the round can be some trial & error and pivoting. The other full year is for the real growth. Rounds C through E, you have the product market fit and you also have a proven scalable go-to-market strategy. A career opportunity for my Turkish friends - We are looking for teammates for our early team. (Sorry, for posting this in English — This is because the target audience is required to have some kind of written and oral proficiency in English language). We’re looking for team mates to join us in our cyber security startup. We are solving an emerging problem in the network security space. The company is headquartered in Silicon Valley and backed by a domain-focused VC fund. Proficiency in understanding and speaking English.